1 Eglinton Square Condos by KingSett Capital in Scarborough. Register below to receive price list and brochure. Some of Toronto's aging shopping centres are seeing proposals for an urban transformation. While some malls have seen an end to their lifespan, others are finding a new life through revitalization. Now, the Eglinton Square Shopping Centre in Scarborough has plans for its own mixed-use project, but without a complete teardown in this case. Introducing 1 Eglinton Square Condos, currently the site is made up of the Eglinton Square Shopping Centre, surface parking lots, and 3-storey residential apartments. 1 Eglinton Square Condos is a new condo and town proposal by Kingsett Capital and is currently in pre-construction at 1 Eglinton Square in Scarborough. The construction of five mixed-use towers for 1 Eglinton Square Condos will range in height from 25 to 40 storeys, along with stacked townhouse rows totalling 3 storeys each. A new private road is proposed to run south of the mall. This is an area where growth is expected to occur along the Eglinton Line corridor where the Crosstown LRT line is now under construction and projected to be completed by 2021. A pair of stations will be located at the northern corners of the site at Victoria Park and Pharmacy Avenue. The added transit capacity will accommodate new residential land that will be added through this development. The residential units are made up of 852 1-Bedroom units, 629 2-Bedroom units, and 159 3-or-more-Bedroom units, with a variety of housing types available (affordable housing, rental, or ownership). In total, 2,606 parking spaces are proposed: 1,127 for retail, and 1,317 for residential plus 162 visitor spaces. 1,250 spaces will be located below grade, 1,155 spaces above grade, and 201 will be surface parking. 1 Eglinton Avenue has a walk score of 99 out of 100. This location is a Walker’s Paradise so daily errands do not require a car. 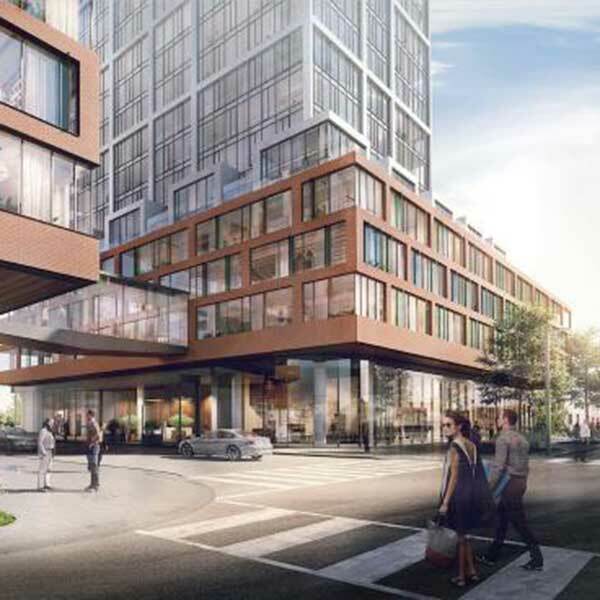 1 Eglinton Square mixed-use redevelopment will feature designs made by Quadrangle Architects. The Project will included Public Space, Residential, Retail and townhouses. 1 Eglinton Square will have five blocks of mixed-use development, with tower heights ranging from 25 to 40 storeys with a total of 1640 Units. Register with us today for Brochure, Floor Plans & Pricing. In order for an investor to take the most advantage of Buying Pre-construction Condos is to buy before it’s open to the public. Prior to opening day of a new condo sales office to the general public, prices may have gone up by $10,000 to $20,000. By registering here today, you will have an opportunity to invest in a unit at the lowest price possible before it’s open to the public. This gives you Guaranteed First Access to inventory best pick at unit levels, floor plans, lowest prices guaranteed and Platinum Access Incentives & Promotions. We are independent Realtors with Re/Max Ultimate Realty Inc., We specialize in pre-construction sales and through our developer relationships have access to INSIDER SALES & TRUE UNIT ALLOCATION in advance of the general Realtor and the general public.